Can you believe that Mother's Day is next weekend? Buddy came home from running errands with dad today and told me that they had a surprise for me!! So I already know what my Mother's Day present is. I have a necklace with all my boys birthstone. So this year we are adding Tommy's stone to it. So that is the necklace he is referring too. I just LOVE how this card came together!! I had a different idea in mind, with lots more die cuts flowers and pearls, but once I finished coloring the image, the idea completely changed. I stamped the Vase with Memento ink and created a mask for it. I stamped the Rose and Bow Bouquet, on top of the mask too look a bouquet of flowers in a vase. It really came out very, very good. Colored the flowers with my Copics. The vase was created using patterened paper from Glitz: Cashmere Dame. Added pearls to the centers of the flowers and surrounding the flowers. Stitched my card to the TH cardstock and adhered it to kraft cardstock. Stamped the sentiment with Memento ink and backed it with the same TH red cardstock and placed it across the vase. What a lovely card. I love the stitching aroundyour card. Those lovely bright red roses and the yellow and blue makes flowers is so nice together. Simple and gorgeous! what a lovely Mother's Day Card!!! Thanks for joining us this week at Created With Love Challenges for our Mother's Day Challenge! So pretty Calypso and I love that vase! Beautiful card! Love what you did with the flowers and the vase!! LOVE! I've got this vase, but haven't used it yet, will have to try this sometime, thanks for the push and inspiration!! Beautiful creation. I love the cas look. Thanks for joining our "Mother's Day" challenge this week at Tammy's Scrapin Corner. Love your colors and the vase is so cool! The CAS look is perfect! Oh I can see my son doing that when he was young- he used to get too excited to hold in a 'secret'!!! Thanks for joining in with us at Created With Love Challenges this week! I really like what you did with the vase and there are so many nice elements to this card, wonderful work! Love it! I always love stitching. But also great idea using patterned paper inside the vase. Pretty pretty. wow I love this love that vase. I am not into the chevron look but this is fab. Thanks so much for joining in the fun at Created with Love Challenges. love how you made this vase! And the addition of a table is fabulous! Very classy Mom's day Card! Thanks foe joining us at Created with Love Challenges. Love the bright colors you used on the Rose and Bow Bouquet. Awesome paper for the vase, love the added stitching and pearls. Beautiful card. I love the design on the vase. What a beautiful Mother's Day card! Love the image! I hope to see you back on Monday for a brand new challenge! Love what you did with these 2 stamps!! Great card! What a beautiful card. Love the vase and flowers! Thanks for joining us this week at Created With Love Challenges for our Mother's Day challenge. Oh my goodness! What a wonderful card! Love the colors and design! 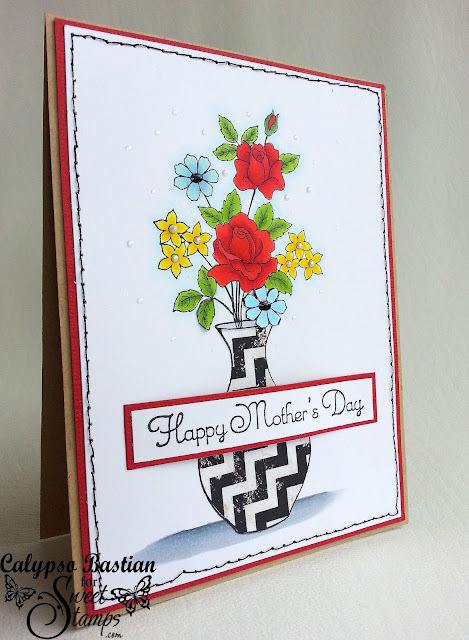 Magnificent design and eye-catching CAS card, Thanks for joining us this week at tammyscrapincorner. This is so lovely! I adore your colors and the ever trendy zig cat looks awesome! Hope you enjoy your new necklace this MotherscDay! You always make something so crisp and clean !! What a lovely talent you have, I always enjoy seeing what you are up to ! So glad you joined us this week at The Kraft Journal !! Gorgeous! Love your coloring and design and the pearl accents! Oh I love the chevron vase and beautiful flowers! Love the colors of this, and the design came out perfect. Thank you so much for joining us over at The Pink Elephant this week!